Library table in solid teak and teak veneer. Thick, removable veneered top, with solid wood apron, ca.1955-1956. Solid teak, thick teak veneer Chandigarh. Pierre Jeanneret designed PJ-TAT-08-A The library table has been designed by Pierre Jeanneret. Together with Le Corbusier working in the 1950es. They created a vision in teak and veneer where PJ-TAT-08-A got very important. We used that furniture with chairs of Perriand and Prouve. Art and design get here important. The existential beauty of modernity and tradition came together. The chair is in teak and cane. Very rare on auctions to sell. With cushions sold for a good price. We sell and buy that. The spirit of India and modernity of Europe created a world, where archaic and modernity get an unity. Le Corbusier left soon the project and was looking for new challenges. 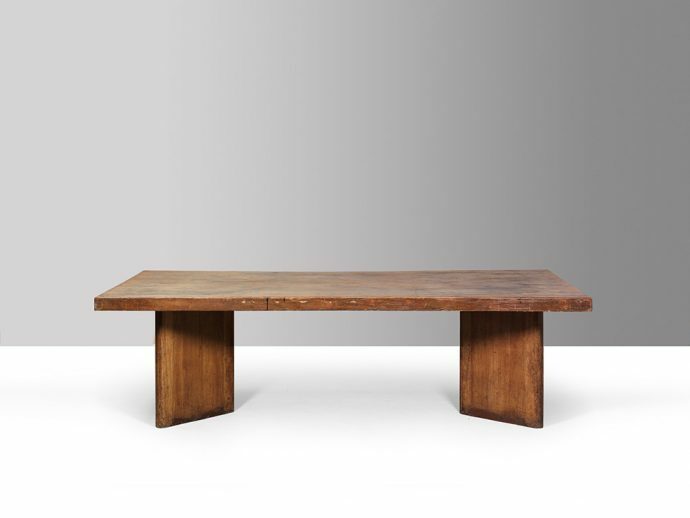 Pierre Jeanneret continued to live in India. There he lived for many years, worked on the city and developed a big amount of great design. Seat of chairs as dining chair or as office object. A piece of history. Extraordinary beauty and fitting to seats and desks. Sofas and desks of high standard. They got sold on auctions like Christies and Wright20. Design and art can be in Paris and in Milano. Most of the galleries are in Tokyo. We sell all and buy that architectural things. Wood table fitting to all Jean Prouvé. Dining and working place for architecture like the villa Savoye.